Raptivity is an interaction tool. Its target audience is the rapid content authoring tool market, but while it tries to hit it, it also misses at many levels. Don’t get me wrong, this is a product that offers some really great features, but it constant pitching within the product to upsell, becomes irritating, so much so, I easily can see someone blasting it into recycle bin space. The solution I looked at was their base, Raptivity Essentials and it comes with a “select pack” called “Zest”, which for some reason on their pricing is shown as a separate option. 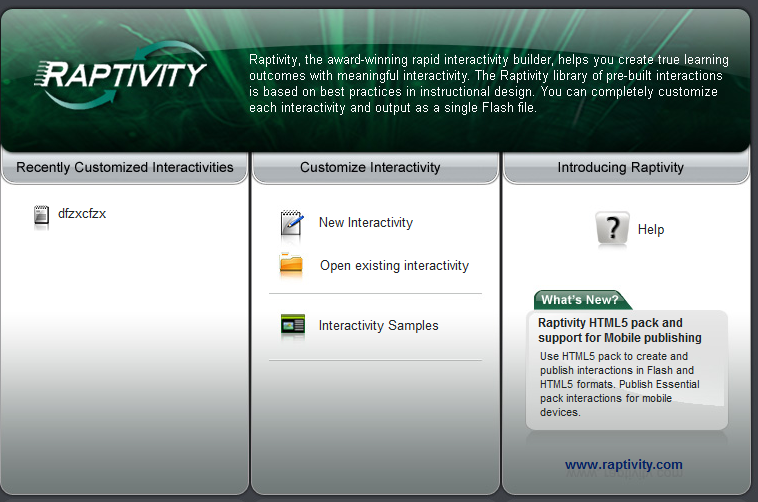 Raptivity calls their product an interaction tool with templates, games, simulations, etc. According to the site the solution comes with 245 interactions. This is somewhat erroneous. In order to achieve that, you have to buy all their packs and the HTML5 pack. But, in order to buy any of the additional packs, you must first own either Essentials or Zest. Oh, one other thing. Before you use the product, you must have Flash 8.0 installed (minimum) and Net Framework 2.0 (which they provided a link). Preview in Real Time, while you are customizing your interaction, game, simulation, activity, etc. Essentials pack – comes with two Glossaries options and two FAQ – when did those become full interactive experiences that stimulate learning? To start Raptivity, you click on the shortcut on your desktop. Yes, this is a desktop solution and not SaaS. After clicking the button, you go right into the product. To create a new interactivity, select “New Interactivity”. 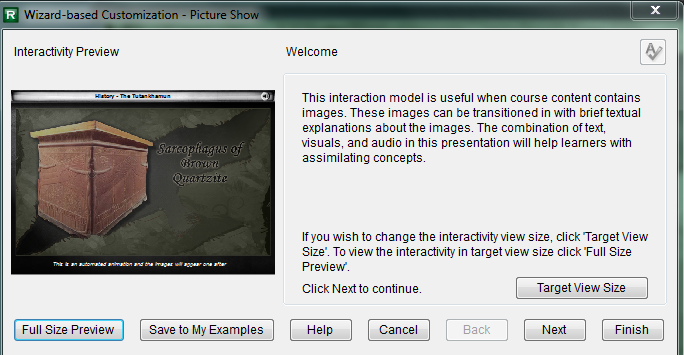 Next you will select from the interaction models. There are quite a few to choose from. The default is the thumbnail view. I don’t know about you, but I was physically exhausted going through them all. At times it seemed to be too many choices, and since many replicated what you saw on previous choices, confusing. A simple way to do this, make it simple. This is just one of the examples of where Raptivity tries too hard to be many things, and instead creates challenges that honestly are unnecessary. The interaction opens up a “wizard window”, which identifies the interaction you selected, and helps you setup the interaction. After you finish, the next screen is your customization screen. This is not your edit screen, from which to work from. The center of the screen is the interaction, from which you customize. It is a real time preview window, so any changes you make will appear quickly. I personally liked this feature, and I wish in general content authoring tools would have it in conjunction with the view in browser window. The left side is your tree, in hierarchy fashion. Below that, is your target size – which you can change, because its default is 715×500. Oh in the center of the screen, you can switch to different views, including thumbnails. This is also where the sound icon, when clicked becomes a parameters window. The toolbar on the top of the screen changes and on the right of the screen is this extensive help section. The middle is your interaction, and below that is where you can begin your customizations. I am unsure why they decided to put the most important part of the editing at the bottom of the screen, especially when it often requires you to scroll down to continue the editing, and not place this on the left side of the screen. 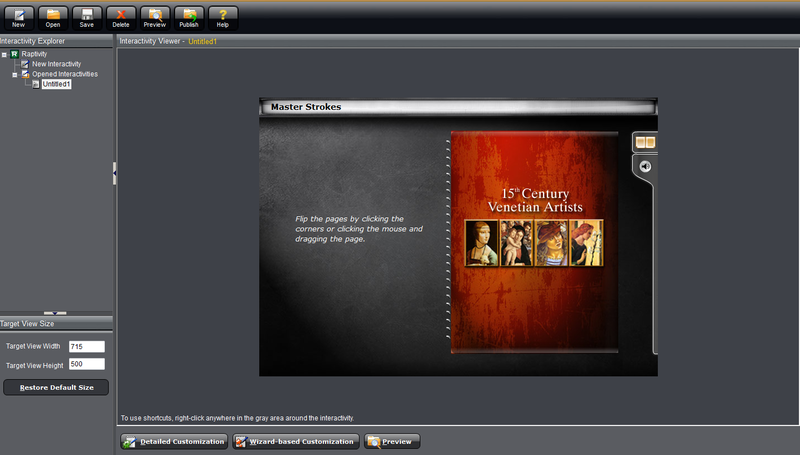 The editing includes the ability to change the background colors, change text, add images – in some cases change the image from the initial interaction, add music or audio. Each change you make is seen in real time on your preview screen. When you are satisfied with your interaction and test it out, click “save” and then you are ready to publish. While Raptivity offers a variety of pricing, based on which pack you choose, they do offer four main options. A discount is available, but only if you are a non-profit, government or in the education sector. Note: In order to add any of the TurboPacks, Standard Packs or Booster Pack 1, without purchasing the Standard package or Himalaya, you must first buy either Essentials or Zest. Additionally, the HTML5 pack is a stand alone pack, so if you want it, you must purchase first one of the four listed above. They do offer premium support for a fee, but the site never states what that includes. Raptivity, has an identity problem. While it offers a lot of interactions it equally contains a lot of unnecessary steps to go to the screen you want to work with – the edit screen. The point of a RCAT simulation tool or as they put it an interaction tool, is create a user friendly product in an easy and engaging way. Sadly, Raptivity fails at even achieving this premise. While the Essentials pack does a decent job, I’m pretty sure no corporate person is going to want the “smiley face” interaction as part of their learning toolbox. Unless they are running a circus.